A recent study shows that despite increased safety standards, infant walkers are still associated with thousands of injuries to children each year. For first-time parents, the sheer amount of gadgets available to growing babies can be overwhelming. But there’s one device that experts say parents should avoid: the infant walker. 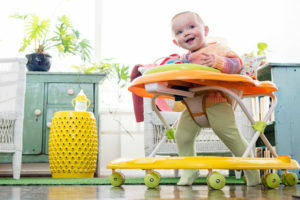 A recent study shows that even after new safety standards were issued in 2010, infant walkers are still associated with thousands of injuries to children each year. The study shows that while injuries have decreased in the last 10 years, infant walkers are still responsible for many injuries to the head and neck — including skull fractures. Children can be very fast in a walker — capable of moving several feet in a manner of seconds — even faster than a running adult, Dr. Giuliano says. In addition to being a safety hazard, Dr. Giuliano says there’s also a general misconception about the value that infant walkers provide to children. For parents who are just hoping to have five minutes to fold some laundry or get dinner on the stove, Dr. Giuliano says there are stationary play devices that are a much safer alternative. Other options include the use of a playpen or blocking off a portion of the room with baby gates. However, even when using these recommended methods, Dr. Giuliano advises parents to make sure their child is in eye sight at all times. Complete results of the study can be found in Pediatrics.